Enabling a People’s Vote, and defusing the present sense of chaos, needs a Government of National Unity. 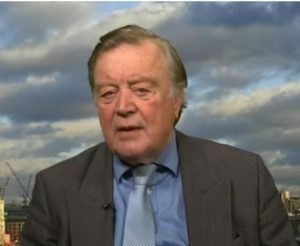 Kenneth Clarke: well-placed to lead a Government of National Unity? In the preceding article, on the People’s Vote, I argued that the process should be given significantly more time. But we also have a real problem: both of the big parties are too fractured either to govern or to face a General Election. The unedifying results create the opposite of the sense of stability needed for such the People’s Vote. This is the time for a Government of National Unity bringing people together from across Parliament, not as a formal coalition between parties, but as an interim arrangement, which would need a more collaborative way of working. The obvious person to lead this is Kenneth Clarke. This is partly because of his own considerable depth and experience. Age means he is also likely to stand down at the next General Election, so it would be clear that the Government of National Unity is there to provide stability in an exceptional time without being subsequently returned to power. 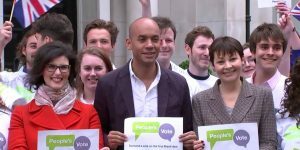 He is also sufficiently unpopular with the right wing of his own party to mean that MPs from across the Commons could support him. The Brexit process began as an internal Tory party squabble, but its resolution has to move from there to mature thinking about the future. Part of this is around the People’s Vote done thoroughly, overseen by a Government of National Unity. This means asking the rest of the EU for a significant extension to the Article 50 period. This is not for significant further negotiation — if Brexit has to happen, May’s deal is pretty good — but to enable things to be done with considered thinking about the future. I suggest that the process needs a People’s Vote, but on a longer timetable than people are suggesting to allow adequate preparation. It needs a Government of National Unity to provide the stability for this to happen, and for enough time afterwards for political parties to draw up manifestos in the light of the result, on which to have a General Election. Support for Remain was hightest among young voters and lowest amongst elderly in 2016. Young people coming onto the register and older voters dying is gradually changing the balance. Even if nothing else changes, these demographic changes will remove the majority for Leave towards the end of 2019. This erosion of the legitimacy of the 2016 vote is a strong argument for a People’s Vote. Support for Remain was highest among young voters and lowest amongst the elderly in the 2016 referendum. Young people coming onto the register and older voters dying is gradually changing the balance. It will take only a few years to reverse the result. 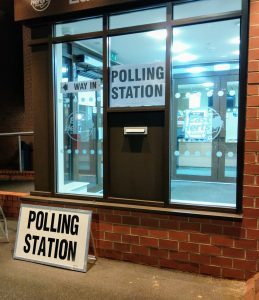 In among all the reasons for a People’s Vote, this erosion of the legitimacy of the 2016 vote is a powerful reason to ask voters again. There’s been lots of discussion of whether the 2016 referendum result makes sense as “the will of the people”. Much of that has centred on lies from the Leave campaign, their apparent bending of election law and the possibility of Russian interference. But YouGov found that 71% of those under 24 who voted, voted for Remain, where among the over 65s that figure falls to 36%. The implication is that, even if no-one changes their mind and there’s no change in voter participation, Remain will be ahead of Leave by the end of 2019. Writing soon after the referendum, David Howarth asked if it is reasonable for the elderly to bind the young like this. In May 2018 The Express took up the story, and also naming serious concern over the long term legitimacy of the result. 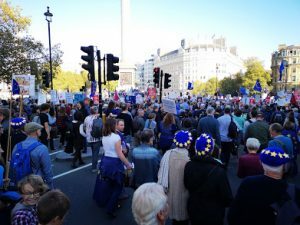 A People’s Vote is looking increasingly likely, but it’s outcome is not in the bag, especially if there are three options. There’s a warning in a comment from Gina Miller: “We discovered that a vast swathe of people who would vote for no deal across the country would do so because their perception is that no deal means remaining”. As a strong supporter of full EU membership, the danger is that I seize on every opinion poll that suggests Remain would win in a People’s Vote. But the polls are still uncomfortably close: Remain is ahead almost everywhere, but not by nearly enough. The tracking at whatukthinks.org shows Remain on 36%, Leave on 33% and “don’t know” at 31%. That’s too close. Over at BrexitCentral numbers are being quoted that show Leave in a strong position. My twitter feed showed a BMG poll putting Remain at 52% and Leave at 40%, with the gap widening, but BMG also have a more fine-grained poll showing 51% against a second referendum, and “Canada Plus” as the preferred option for all age groups except those under 34.